PAUL COOK has promised to send out a powerful side as Pompey bid to make the Premier League Cup group stages. The Blues’ reserves face Barnsley at Westleigh Park on Monday (7pm kick-off) as they aim to progress from the final qualifying round meeting. Supporters are set to get their first glimpse of Dominic Hyam, following his arrival from Reading on loan until January. He is likely to partner Matt Clarke in the middle of defence, with Conor Chaplin also earmarked for a runout. Chaplin could link up with Noel Hunt up front, with Ben Close, Adam May, Liam O’Brien and Ben Tollitt also set to feature. Pompey will keep close tabs on Brandon Haunstrup and Adam Buxton as they recover from injury before deciding whether to give them playing time. Kyle Bennett is another player who has not been featuring much for the first team of late. Cook is hoping for a decent turnout for a game which provides a useful opportunity to get minutes into his players. He said: ‘It’s a terrific game for our lads. ‘You don’t want matches where players are going through the motions – and these are proper games. ‘So a good crowd to come out at Havant and back the lads would be good. ‘We could nearly field a team of completely under-age players. That’s a great credit to the club. ‘We’d play the same changes in the Checkatrade Trophy. 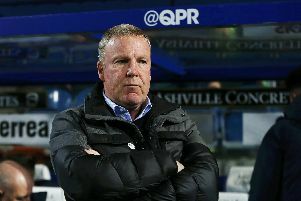 What are the bookmakers’ odds on Portsmouth’s Kenny Jackett being appointed QPR boss? ‘So our lads are now getting good game minutes. ‘It was a great game against Southend. A proper football match. A win for Pompey would see them pitted against Norwich, Wolves and Everton in the group stages of the under-23 competition which allows three over-age outfield players and an over-age keeper.